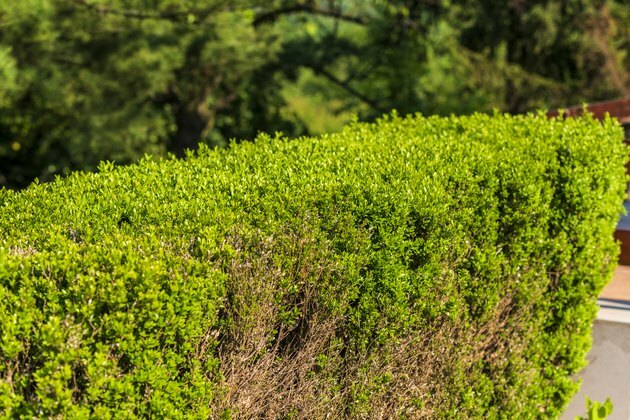 Yew shrubs grace landscapes from Alaska to Virginia with their flat dark green needles and red berries. Their varying shapes make them useful landscape plants. Low-lying shrubs serve as ground covers while uprights provide shade and privacy screening. yews serve ornamental and decorative purposes. Three yew species used primarily for landscapes are Japanese yew, English yew, and hybrids between the two. Less cultivated yews, like the Canada yew and Pacific yew, are indigenous to North America. English yew is not as cold hardy as Japanese yew but the "Repandens" variety can withstand USDA hardiness zone 5. Repandens, an English yew hybrid likes to spread out and can reach heights of 4 feet. Fastigiata is a narrow growing erect cultivar. Some low-lying English yews such as Watnong Gold differ not only in growth but foliage color as well. This ground-cover produces yellow foliage. Japanese yews are capable of withstanding colder temperatures than English yew cultivars. The "Emerald Spreader" cultivar is a thick, dark green ground cover capable of withstanding temperatures of 40 degrees below zero. Green Wave, another cultivar, is named for its dark green color and arching branches. With a mounding growth habit, Green Wave reaches heights of 4 feet and widths of 8 feet. Tall, upright Japanese yew cultivars include the cone-shaped 50-foot tall Capitata. Japanese and English yew hybrids exhibit the best traits of both species - hardiness combined with ornamental qualities, withstanding zone 4 climates and covering landscapes with wide, spreading dark green shrubbery. Brownii is a globe-shaped cultivar and Hatfieldii is a dense, cone-shaped bush well-suited for privacy screens. Pacific yews grow along the length of North America's west coast - from California's southernmost coastline to northern Alaska. Their evergreen habit and narrow leaves make them adapted to both cold and warm climates. They are a slow-growing upright tree not usually found in residential landscapes. Canadian yew is an eastern North American yew species found growing from northern Canada into Tennessee and Virginia and as far west as Illinois. Canadian yew is a multi-stemmed slow growing shrub suited for residential landscapes. A favorite of container gardeners, yew shrubs grow best in areas noted for their shade while avoiding full sun. They thrive in rich, well-draining soil, but don't do well in clay-based soils. Prine yew in summer or early Autumn to avoid overgrowth. Once roots are established, yew will spread out and provide you with foliage for years to come.